Remember the first time you ever heard a live band that grabbed you by the ears and wouldn’t let go? Maybe not for a lifetime. You walked into the theater on a hunch, a tip or just a lucky accident. Then, a musician you’d never met struck a chord that resonated within your soul. Your life as a music listener divided at that moment, into before and after. For me, that happened one night in Nashville’s War Memorial Auditorium, in the early Seventies. It was one of those apples-and-oranges double bills like Bill Graham put on at his Fillmores, East and West, mixing up the likes of the Dead or Quicksilver with soul singers, folk musicians and straight-ahead Jazz cats. My big night started out calmly enough, with a mellow set by the Marshall Tucker Band, who more of us will probably remember than admit remembering. With a twang and a flute in 4/4 time, they were perfectly adequate. Then came something completely different. Five men dressed in white walked to the front of the stage. A tall, thin Englishman asked for a minute of silence. The first thirty seconds of that came for free, as the audience puzzled over the unfamiliar request. But I wasn’t so surprised. This was the home of the city’s symphony orchestra, after all. Every time I’d been there on school field trips, they began by ordering us to be quiet. But this Bubba-studded crowd started to grumble. “Play some music!”, someone demanded. Someone else, in the back, yelled,”Whipping Post!” That broke the tension, a perfectly timed joke lifted from the Allman Bros.’ live album of the time. Finally, the long minute passed and the Orchestra began to play. The Mahavishnu Orchestra. Rivers of surging electric violin poured from the stage, while a double-necked electric guitar shot lightning bolts at the ceiling. Chiming keyboard notes clattered the chandeliers. A landslide of drums tumbled over the crowd who, caught helplessly in their seats, had no chance to resist. The world hadn’t known such a juggernaut as John McLaughlin’s breakthrough instrumental ensemble. Like no band before and few bands since, it mixed classical complexity with Jazz audacity, delivered with the amplified power of arena rock. Although a commercial success, Mahavishnu was dismissed by generations of critics under the dreaded label of “fusion.” Much of their music is unendurable to me now, but at the time, the wonder was that there could be such music at all. So wild, but so controlled, so committed, so composed, so free. I’d never heard their records, and the music certainly wasn’t played on the local Top 40 stations. This was the very first Jazz I’d heard, except in some passing, lo-fi soundtrack. And I’d walked in expecting some guy to sit on a cushion and play sitar, or something. Virgin ears — that’s what I brought to that concert, and it was part of the magic. I’ve tried to recreate that feeling, but as every ex-virgin knows, it’s a bit more difficult now. But the challenge has come, and I’m doing my best to meet it. 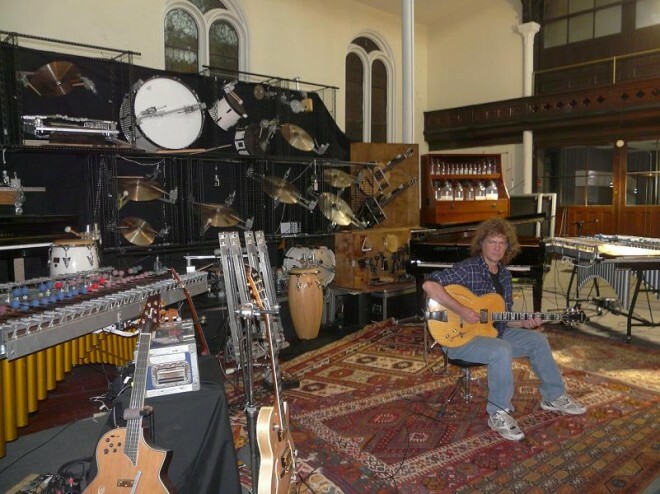 Every day, I say this little affirmation to myself: “I will not listen to the new Pat Metheny album.” Not yet. And don’t think about an elephant, either, that’s about as hard. For I’ve followed Metheny like a sunflower follows the light, ever since he emerged as a more melodic, less frenetic master of his own post-fusion school of eclectic, adventurous jazz. Now he’s debuted a new project, the Orchestrion. Rumor has it as a remotely-controlled array of acoustic instruments forming a backup band, inspired by the mechanical orchestral music machines that were briefly popular a century ago. I imagine a steam calliope that brought all its friends along to play, with the Mighty Oz standing behind the curtain in a striped shirt. Me, I’m keeping cotton in my ears until the Orchestrion Tour arrives locally, on May 5. Only three (ouch) months (damn) away (no!). Am I crazy? Am I denying myself sure pleasure now, in exchange for future delight? Maybe I’d enjoy the live performance better if I was familiar with the music, the better to follow the flow. I dunno– I don’t even know if I can keep my curiosity in the bag for that long. ”Jazz is the music of surprise,” said Duke Ellington. Should be, anyhow. I’ve grouched about other musical efforts that didn’t bother to try stretching envelopes — including Pat’s recent string of Trio records. Now, the most inventive Jazz guitarist since Les Paul has been tinkering again. I can’t wait to hear what he’s come up with. But I will wait… until I can see it for myself. Has anyone else ever faced this dilemma? My best advice is to avoid it. Instead, check out http://www.patmetheny.com for the whole scoop. If you like what you hear, do me a favor and don’t tell me too much about it. But do yourself a favor,too.There might still be a seat available when the Orchestrion visits your town.